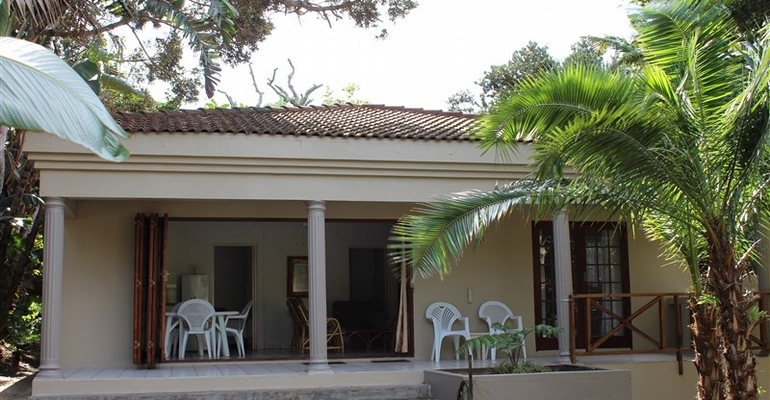 Lala Palm Lodge offers upmarket accommodation ON THE BEACH in Glenmore/Munster on the luxurious KZN Lower South Coast. Whether you are sun & fun seekers, golfers, fishermen, nature lovers, adventurers, avid birders, or just wanting a tranquil, relaxing getaway, LALA PALM LODGE is your perfect destination. ACCOMMODATION: At Lala Palm Lodge, you will experience the BEST OF BOTH WORLDS; the breath-taking Indian Ocean on your doorstep, & the tropical fauna & flora paradise surrounding the chalets. There are 4 luxury chalets on our large property, each with 3 bedrooms & 2 bathrooms (main en-suite), a fully equipped kitchen, & a spacious living area with stack doors that open onto a stunning patio with its own private braai area. Our 6-sleeper chalets are positioned to maximise privacy, & are nestled among beautiful indigenous trees, where an abundant wealth of birdlife, little Blue Duiker, Bush Buck & Dassies surround us. There is DSTV in each chalet, & a sparkling swimming pool on site. The property is fully electric fenced, with secure parking. BEACHES & FISHING: A short stroll of less than 75m across the road takes you on to our pristine Munster Beach, where ledges & rock pools abound with marine life, with excellent fishing spots. A short walk north along the beach brings you to Dolphin Bay, the ideal location for whale watching. A leisurely beach walk to the south finds you at the well known & magnificent Glenmore Beach; a very popular flagged swimming & surfing beach. Glenmore Beach is also our closest boat launch site. The lower South Coast is a FISHERMEN''S PARADISE, with great fishing spots for kilometres along our beautiful coastline. Other popular beaches in the area, within a 15 minute drive, include Port Edward, Leisure Bay, Trafalgar Beach (Blue Flag), Marina Beach (Blue Flag) & Ramsgate (Blue Flag). GOLFERS'' PARADISE: The KZN South Coast is home to numerous top golf courses; a golfer’s dream! 10 - 15 minutes drive from Lala Palm Lodge, we have the Wild Coast Sun Golf Course, Sanlameer, Southbroom & Port Edward. 45 minutes drive north of Lala Palm Lodge will take you to Umdoni Park Golf Course & Selbourne Golf Estate. Other courses to be found in the area are Margate & Port Shepstone, to name but a few. OTHER ACTIVITIES INCLUDE: Mountain Bike trails Birding & hiking trails at our 2 nature reserves; Mpenjati & Umtamvuna Whale watching Beach horse riding Water sports at The Pont Water World at the Wild Coast Sun Wild Coast Casino Beaver Creek coffee farm & restaurant Fishing charters Extreme activities at Oribi Gorge Nature Reserve, including swing, zip line, abseiling & white water rafting Crocodile Farm Snake Park Shark Cage diving Numerous restaurants & pubs We look forward to creating beautiful memories for you at LALA PALM LODGE! From R260.00 per person, per night. We also offer B&B packages for Business Travellers.